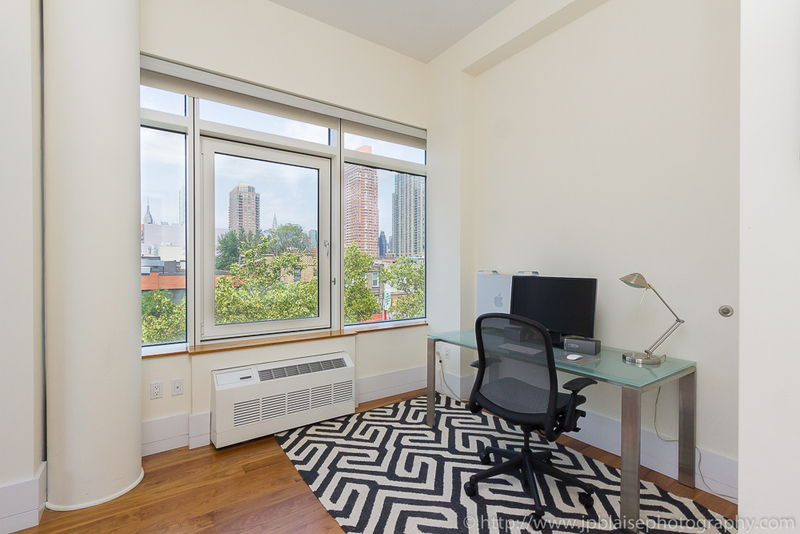 Great apartment photo-shoot today: check out this beautifully outfitted two-bedroom, two-bathroom luxury condominium at 1 Vernon Jackson, Long Island City, Queens. This third floor home features two generous balconies with stunning open Manhattan views, soaring 11′, 2″ ceilings, rich 3/4″ solid walnut floors, triple-glazed heavy duty custom windows and design like nothing else you will find in Long Island City. The spacious chef’s kitchen was made for entertaining. It boasts white Jenn-Air appliances, a Liebherr refrigerator, a powerful garbage disposal and an abundance of granite counters for all your cooking needs. There’s plenty of storage space above and below with pristine bespoke cabinetry. The living room features floor to ceiling windows and spills out onto two balconies. From the first one you will bathe in dramatic views of some of Midtown Manhattan’s most iconic buildings. This is the perfect setting for an after-work sunset drink or coffee in the morning to kickstart your day. The second balcony offers southern exposure and is large enough to host a dinner party with several of your friends. The master bedroom offers excellent closet space and huge windows allowing plenty of natural light to stream in. Its en-suite luxurious bathroom enjoys a spacious shower, modern fixtures and granite highlights that match the kitchen aesthetic. The second bedroom features a large closet as well as beautiful views of Midtown Manhattan. A second bathroom with a deep soaking tub and great finishes is also part of this amazing condo apartment. Contact Todd Hovanec at Luminous Realty (212.203.2016) for an exclusive tour! The full ad can be seen on Streeteasy.